An artist concept image of where seven carefully-selected instruments will be located on NASA’s Mars 2020 rover. The instruments will conduct unprecedented science and exploration technology investigations on the Red Planet as never before. NASA has announced the selection of seven science instruments to be included on the Mars 2020 rover. Three scientists from the University of Hawaii at Mānoa School of Ocean and Earth Science and Technology (SOEST) — Sarah Fagents, Shiv Sharma and Anupam Misra — will be members on the instrument teams to conduct unprecedented science and exploration technology investigations on the Red Planet. The new rover will carry sophisticated hardware and instruments to perform geological assessments of the rover’s landing site, determine the potential habitability of the environment, and directly search for signs of ancient Martian life. Among the instruments selected is the Mastcam-Z, an advanced camera system with panoramic and 3-dimensional imaging capability with the ability to zoom. As the Mastcam-Z team’s volcanologist, Sarah Fagents, a researcher at UHM’s Hawai‘i Institute of Geophysics and Planetology, will identify and interpret rocks and terrains of volcanic origins that are encountered by the Mars 2020 rover. 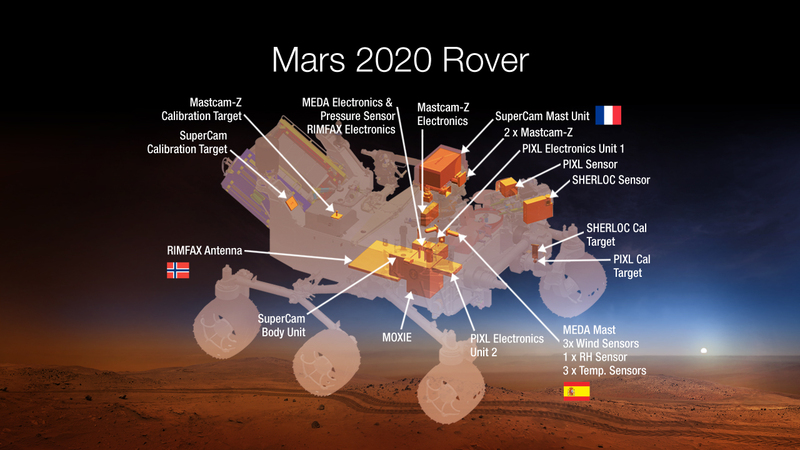 Further objectives of the Mastcam-Z investigation on the NASA Mars 2020 rover are to assess current atmospheric and astronomical conditions, events, and surface-atmosphere interactions and processes; and to provide operational support and scientific context for rover navigation. The SuperCam instrument can provide imaging, chemical composition analysis and mineralogy, and can detect organic compounds from a distance on and in rocks, soils and sediment layers on Mars. On this instrument team, researcher Shiv Sharma and associate researcher Anupam Misra, both experts in Raman spectroscopy and fluorescence at HIGP, will assist with detection of biomarkers — indicators that life has been or is present. Raman spectroscopy is a technique that aims a laser beam at rocks or other material and, based on the specific wavelengths of light that are emitted back toward the instrument, uniquely identifies minerals and organic substances. 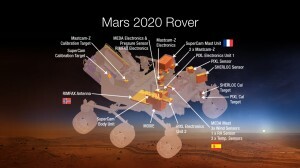 SuperCam encompasses the spectroscopy and imaging capabilities that were successfully fielded on Mars rover Curiosity and adds new remote Raman spectroscopy capability, which has undergone years of development in the laboratory and addresses the astrobiology component of the 2020 mission. “This will be the culmination of over 15 years of work within HIGP developing the time-resolved active spectroscopic techniques for Mars rover from remote distances. We are thrilled to be the part of SuperCam Team,” said Sharma of his and Misra’s involvement in the SuperCam team. “Mars research has been a major focus of HIGP since the late 1970s, when Chuck Helsley and Tom McCord founded the Planetary Sciences Division of [then] HIG, and researchers made many telescopic observations of the planet from Mauna Kea. Since then, HIGP faculty have been science team members or project scientists on several earlier missions to the Red Planet, including the Mars Global Surveyor and Mars Odyssey missions. We are proud to see the continuing success of HIGP scientists on the Mars 2020 team,” said Rhett Butler, Director of HIGP. The Mars 2020 rover also will help advance knowledge of how future human explorers could use natural resources available on the surface of the Red Planet. An ability to live off the Martian land would transform future exploration of the planet. Designers of future human expeditions can use this mission to understand the hazards posed by Martian dust and demonstrate technology to process carbon dioxide from the atmosphere to produce oxygen. These experiments will help engineers learn how to use Martian resources to produce oxygen for human respiration and potentially for use as an oxidizer for rocket fuel. NASA’s Jet Propulsion Laboratory will build and manage operations of the Mars 2020 rover for the NASA Science Mission Directorate at the agency’s headquarters in Washington.